Wes Zane, co-owner of Caliente Del Sol and Good to Grill in the Safeway Kapahulu retail center, poses for a portrait in his Mexican eatery, which features chairs decorated with family silverware. Wes Zane of Laughing Gravy Restaurants says he knows it's a bit crazy, but he is on course to open four new restaurants this year. Zane and chef Alfredo "Almar" Arcano, who together are best known for the Formaggio Wine Bar in Kaimuki, opened Formaggio Grill at the start of this year in Kailua, followed by Burgers on the Edge and Caliente del Sol at the Safeway Kapahulu retail center. Good to Grill, which is adjacent to Caliente del Sol at the center, will open in about a week. 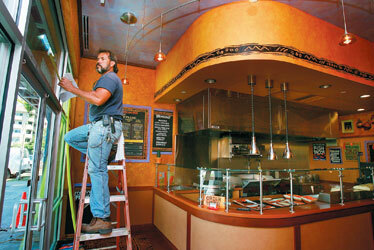 What's more, Formaggio Grill in Kailua is also expected to expand, adding a private dining room. That brings the total of the Laughing Gravy collection to five restaurants on Oahu, offering nearly 7,000 square feet dedicated to good food and wine. Zane says if he knew a year and a half ago the direction the economy was headed when he signed the leases for three new restaurants at the new Kapahulu Safeway retail center, he still would have moved forward with his plan. The time is right for fast-casual restaurants, he said, offering gourmet fare for less than fine-dining prices. Besides, he and Arcano are driven by their passion for food and restaurants, which continues regardless of the economy. You might call Wes Zane of Laughing Gravy Restaurants a bit crazy - or zany. Restaurant Opening Date Sq. ft.
Zane, 57, calls himself crazy, given that he's opened three new restaurants, with one more to follow this year. Besides Formaggio Grill in Kailua, which opened in January, Burgers on the Edge opened in Kapahulu in July, followed by Caliente del Sol in Kapahulu this past Sunday. Good To Grill is set to open in about a week - also in Kapahulu. In all, the four restaurants this year amounted to about $3 million in investments for Laughing Gravy Restaurants. But it doesn't stop there. Formaggio Grill in Kailua is expected to expand soon into the pizza joint next door, adding a private dining room to its offerings on the Windward side. "I am crazy," said Zane, president of Laughing Gravy. "You have to be a little bit crazy to be in the certified restaurant business." At the same time, Zane already had signed the lease for the three restaurant spaces at the new Avenue Shops at Safeway Center on Kapahulu more than a year ago. That was before a series of layoffs rippled through the Hawaii economy and the summer slump in tourism. When the opportunity to secure a lease in the new Kapahulu retail center came up, Zane went for it. "These are great locations," he said. But if he knew the economy was heading down, would he have gone ahead with opening four new restaurants this year? "The answer is, without a doubt - yes," said Zane. Contractor Sal Smith, above, measures the doorway of Caliente Del Sol for a sign, as the eatery in the Safeway Kapahulu retail center was readied for opening night. All three of the Kapahulu restaurants, according to Zane, are perfect for the times. They're fast-casual restaurants, offering casual gourmet fare for less than fine-dining prices. "I think people still want to dine well, but they want to pay less," he said. His goal was to open restaurant concepts that people would frequent often as repeat customers. Diners can either eat in or take out. Every new concept was dreamed up over a bottle of wine by Zane and his partner, chef Alfredo "Almar" Arcano. They have known each other since 1976, when they both worked at Hy's Steak House in Waikiki. Both are best known for opening the Formaggio Wine Bar at Market City Shopping Center in Kaimuki, which the pair took over in 2004. The award-winning hole-in-the-wall is still a popular spot for its casual gourmet fare, more than 50 wines by the glass and live music. Burgers on the Edge was inspired by a barbecue in a friend's backyard - where they broke open an expensive bottle of 1982 Chateau Petrus - paired with hamburgers. "Normally, you don't have a burger with a bottle of wine like that," said Zane. But it was soul-satisfying, he said. Alfredo "Almar" Arcano, right, co-owner and chef of Caliente Del Sol and Good to Grill,runs a kitchen for both eateries at the Safeway Kapahulu retail center. So gourmet burgers are on the menu at Burgers on the Edge, right up by the sidewalk at the Safeway Kapahulu shopping center, offering a combination of flavor profiles. Caliente del Sol is a fast casual Mexican-inspired eatery offering tacos, enchiladas and burritos, while Good to Grill will offer Kiawe-wood fired pizzas, panini, salads and lunch plates. The choices of cheeses and sauces, of course, are what will set these eateries apart, according to Zane. Quesadillas come with Tillamook, Manchego and smoked Gouda, for instance, and Keawe-smoked meats. While it is a business, Zane said a love for good food, wine and the creativity that goes into developing new concepts is what keeps him going. The motto for Laughing Gravy is "Live Well, Laugh Often." "I do it for passion," said Zane. "It's also the hospitality nature of the business. I like to see people happy. I like to provide venues where friends and family can get together." There is a sense of humor - from the description of "Kaimuki tap" on the menu at Formaggio Wine Bar to the art on the walls at Formaggio Grill, done by local artist Ron Genta. There are also personal touches. At Caliente del Sol, silverware from Zane's parents dangle from the bottom of turquoise chairs. The walls there also feature art by Genta. The largest investment, by far, was the $1.7 million that went into Formaggio Grill, the Kailua companion to the original wine bar in Kaimuki. 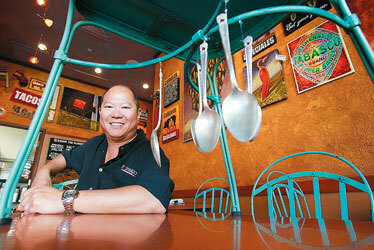 But Zane, a Kailua resident, said: "I positioned Formaggio Grill as a neighborhood wine bar. I felt Kailua had a need for something like that - a little more upscale, but still comfortable and relaxed." Formaggio Grill went into a former printing shop, which had to be built out with a kitchen and grease trap. The spaces at Kapahulu, however, already were slated for restaurants. Though Caliente del Sol and Good to Grill are two separate restaurants, they will share the kitchen in the back, part of what Zane calls dual efficiency. Zane and Arcano have concocted several more concepts over wine, but for this year, four restaurants is enough. Though he's constantly working, Zane insists this is all fun. "If it ain't fun, then it ain't worth it," said Zane.